Which child would you save? A decision no parent can even fathom. Eliot Gordon would do anything for her family. A 38-year-old working mother, she lives an ordinary but fulfilling life in suburban Atlanta with her partner, Grant Delaney, and their three daughters. The two older girls are actually Eliot's stepdaughters, a distinction she is reluctant to make as she valiantly attempts to maintain a safe, happy household . . .
Then Finn Montgomery, Eliot's long-lost first love, appears, triggering a shocking chain of events that culminates in a split-second decision that will haunt her beloved family forever. How Eliot survives-and what she loses in the process-is a story that will resonate with anyone who has ever loved a child. With hilarious honesty, wrenching depth, and a knockout twist, I COULDN'T LOVE YOU MORE illuminates the unbreakable bonds of family and reveals the lengths we'll go to save each other, even as we can't save ourselves. 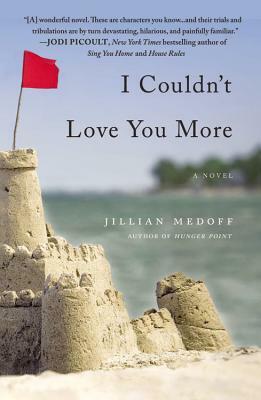 Jillian Medoff attended Barnard College and received an MFA in Creative Writing from NYU. A former fellow at the MacDowell Colony, Blue Mountain Center, VCCA and Fundacion Valparaiso in Spain, Jillian has taught at NYU and the University of Georgia.